Brady Quinn's loss was Cleveland's gain. Everyone has an opinion, especially when it comes to how teams fared in each year's NFL draft. And this year is no different. 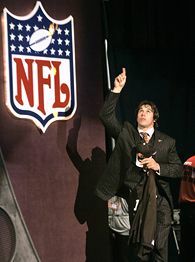 While the top pick ultimately lacked the drama of last year, when Houstons surprised most by taking Mario Williams ahead of Reggie Bush and Vince Young, drama developed as Brady Quinn slipped down the draft board and Randy Moss slipped out of Oakland in exchange for a fourth-round pick from the Patriots. The long wait may have been tough for Quinn, but it helped the Cleveland Browns emerge as this year's draft valedictorian. Thanks to a couple of 'A+' marks offsetting Mel Kiper's turn as the Russian judge, the Browns registered a perfect 4.0. For the second year in a row, the Washington Redskins represented the bottom of the class, as experts didn't feel selecting safety LaRon Landry was enough to offset another year of limited picks. Below are the grades handed out by nine different outlets followed by the consensus GPA, based on a 4.0 scale. NOTE: USAToday.com's Tom Weir actually used a 4-star system, which we adjusted to a grade, ranging from A (four stars) to D (one star).